KOTA KINABALU: A joint task force comprising agencies from two state ministries will be formed to address the alarming rate of elephant deaths in Sabah. Measures were needed to protect the elephant population and prevent their extinction, they said. “A special task force will be set up, comprising officials from the ministries and relevant agencies,” they said, adding that the Sabah Wildlife Department (SWD) had been tasked with preparing a paper on the proposed solution to the human-elephant conflict in Sabah. This paper, to be prepared by SWD assistant director Dr Sen Nathan, would be submitted to the state Cabinet for consideration. Liew said the joint meeting was in response to the call by Chief Minister Shafie Apdal to the two ministries to collectively address the problem. A total of 116 elephants have died between October 2010 and September this year. In that period, 2018 recorded the highest number of deaths with 30 cases detected so far. The deaths are due to snare traps, lack of food and diseases, among others. In the latest case, a female elephant, aged between 12 and 15 years old, died at the Gunung Rara Forest Reserve in Tawau on Oct 18. The SWD said the elephant died from injuries sustained in a fight with other elephants. Most of the deaths were recorded in the east coast districts, namely Tawau/Kalabakan, Lahad Datu, Kinabatangan and Sandakan/Telupid. 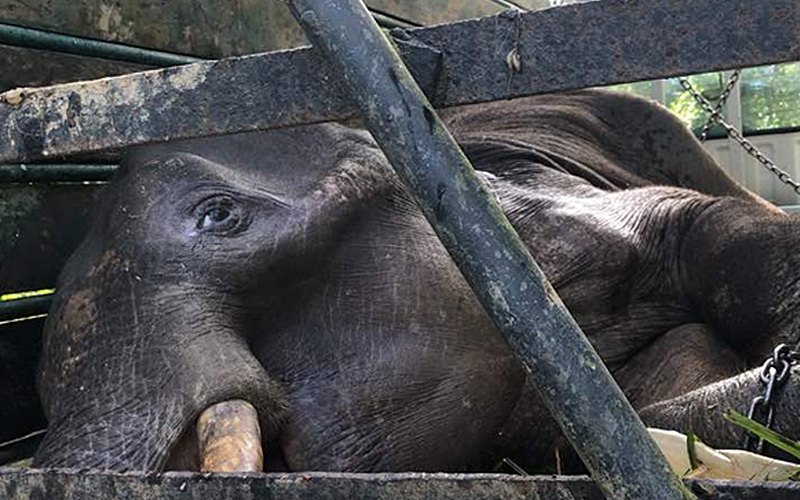 Liew and Wong said that given the loss of their natural habitat, the 2,000-odd elephants needed a home so that they would not encroach into oil-palm plantations and risk getting snared or shot to death. Currently, the elephants are concentrated in the Lower Kinabatangan Managed Elephant Range (MER), Tabin MER and Central Sabah MER in the Danum area. Liew and Wong also urged plantation owners and workers not to harm the animals that have encroached onto their land. Instead, they should inform the authorities such as the SWD so that appropriate action could be taken. Meanwhile, the tourism, culture and environment ministry’s permanent secretary Datu Rosmadi Sulai said the presence of 15 elephants at the Lok Kawi Wildlife Park near here was not ideal. “Ideally, by international convention, the zoo should have only four to five elephants. So the rest should be in the wild but then there is not enough food,” he said, emphasising the need to relocate 10 elephants to other areas. When asked by Liew the reason for the five-month delay to complete the renovation work at the wildlife park, Rosmadi said the work would be done by the end of this month. An NGO, Friends of the Orangutans Malaysia (Foto), had called on Liew last June to address the deplorable conditions endured by the animals at the wildlife park, located about 30 minutes drive from here. Its director Upreshpal Singh said the organisation received several photos showing the elephants at the park were kept in chains while cages for sun bears and pythons were littered with faeces on the floor. The NGO also claimed the tigers in the park were kept in tiny enclosures.